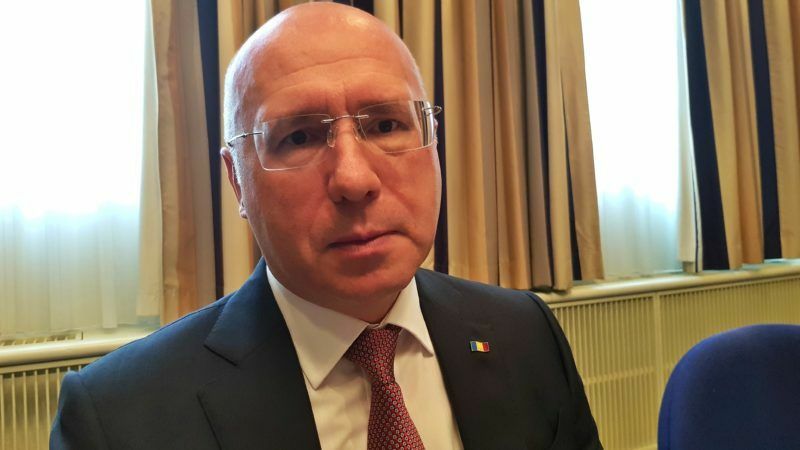 Pavel Filip has served as PM of Moldova since 20 January 2016. He previously served as the minister for information technologies and communications of Moldova from 2011 until January 2016. Filip has been a member of the Democratic Party of Moldova (associated to the Party of European Socialists PES) since 2010. Mr prime minister, we are speaking one day ahead of the Eastern Partnership (EaP summit, held for the first time in Brussels. Don’t you think that since it was launched in 2009 this initiative needs a new format? Maybe an EaP+ format for the countries most interested in European integration: Moldova, Ukraine and Georgia? It is symbolic and important to discuss this just ahead of the 5th Eastern Partnership summit. Symbolic also because we find ourselves at the heart of the EU, in Brussels. I have seen the messages from the European Parliament and we are ready for a EaP+ partnership, because it’s natural: some move faster, others slower. I consider that Moldova, Georgia and Ukraine have advanced more, they have association agreements with the EU and DCFTAs (Deep and Comprehensive Free Trade Agreements). We are ready [for such a format] and it seems only natural to me. Don’t you think that in your country the risk exists that the communists would accede to power and change its geopolitical orientation? What could be done to reach a point of no return? I like very much your question, it is very important. The truth is that for a long time society in Moldova has been divided between those who are pro-East and those who are pro-West. My objective is that by the end of my mandate as prime minister the process of Moldova’s integration in the EU becomes irreversible. It was difficult in the beginning of the mandate in January 2016, because all opinion polls showed at that time that the pro-East side had the upper hand. By the efforts we deployed, we proved that things can change. To our great satisfaction the last opinion poll, made by a US company, shows that for the first time since 2014, the Moldovans with European aspirations are 11% ahead of those with Euro—Asian aspirations. Without any doubt, this is a result of the reforms we implemented in this short period of time, and we have one more year before the parliamentary elections to make sure that this support is even more solid. The Transnistria conflict persists. One purpose of these frozen conflicts is also to dissuade the EU from building closer relations with countries that have problems with their neighbours. How do you expect to move forward with this problem? In my view the time of the frozen conflicts has passed. There was a period when we were at an impasse. I’m glad to inform you that last year, after a period of several years of German chairmanship of the OSCE, we managed to resume the negotiations in the 5+2 format [Russia, Ukraine, the OSCE, Moldova, Transnistria, as well as the USA and the EU]. I must say that we have ourselves deployed extraordinary efforts and this year, we register progress. Only last week I participated in an inauguration event of a bridge linking the left and right banks of the Dniester river. This is a project which had been impossible since 1992. On this occasion I have held a very short discussion with the so-called leader of Transnistria and in my view there are now perspectives for finding solutions to several problems discussed over the years, in the first place solving the problems of people living on this territory, while next year we could also try to identify a political solution by providing a special status to this region. From this perspective, I’m reassured by the language that is being negotiated for the EaP summit declaration. For us, the involvement of our European partners is very important. Moldova didn’t subscribe to the EU sanctions against Russia, which helps you in your relations with Russia, if I am not wrong? We try not to block the processes of re-integration of the country [Transnistria]. As you know well, Russia is an important player in the Transnistria conflict settlement. At the same time I have to recognise that we face a blocked communication with Russia. Even if after the presidential elections of last year we have a president who is radically pro-Russian, I need to recognise that relations have become worse. In 2016, before the presidential election, we tried to warm up our relations with Russia. I personally had meetings both with President Putin and Prime Minister Medvedev. We succeeded in unblocking things, we even convened the inter-governmental commission and we drafted a plan of measures, although we couldn’t move forward. The obstructions from the Russian side persist, linked to the economic side, we have customs duties, we have different embargoes still valid as we speak. And more importantly, we have no answer whatsoever from the Russian side regarding a fraud which we call “laundromat”, a scheme under which many billions from Russia have been laundered via a bank in Chisinau. We are still waiting for Moscow’s reaction. A lot is been said about hybrid war. How do you see it? I think that for the times in which we live hybrid threats are a normal notion, because not only tanks represent a threat, it’s even worse when you are exposed to propaganda. In Moldova there are many Russian speakers, for historical reasons, and via Russian TV and radio channels we are exposed to propaganda which I would qualify as rather aggressive. This also influences the popularity of the EU among our citizens. But despite this propaganda, we have succeeded in regaining a high popularity and support for our pro-European course.